The book is called An Elephantasy, and it’s by María Elena Walsh (and it’s translated by Daniel Hahn). It is about a woman, and one day she takes her dog out for a walk, and at her doorstep is an elephant – not a bird, not a squirrel, not a stray cat, an elephant! She makes the elephant her pet, and one day the elephant gets stuck up a tree! The only person who can get him down is the fireman – in fact, he’s the only person who can do anything. The only way to get the elephant down is to put wings on him, but then the elephant and the fireman fly off on a journey! It was really funny and awesome! My favourite part was when the elephant was stuck up the tree, and no-one could do anything. Literally, the only thing thing the woman’s brother Roberto could say was “We’re toast”! I recommend this book to other boys and girls who like elephants. I hope I see him next time I go to the zoo! Today’s post, then, looks at another classic of overseas children’s fiction, a chapter book running to just over 180 pages. 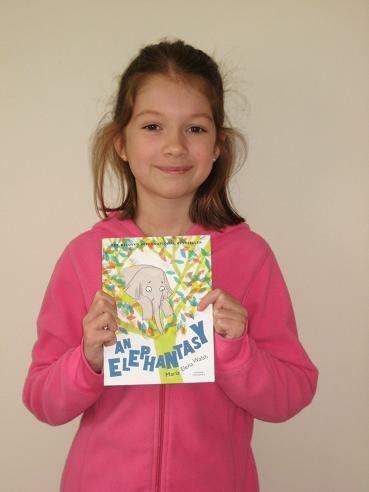 María Elena Walsh is a major figure in Argentina, and her 1966 book Dailan Kifki, translated here as An Elephantasy, is an extremely popular and acclaimed work, featured in Julia Eccleshare’s 1001 Children’s Books You Must Read Before You Grow Up. Quite apart from its quality, though, it’s a funny, madcap story, with a larger-than-life hero who manages to bring people together. My name is Dailan Kifki, and I beg you not to be alarmed at the fact that I’m an elephant. My owner abandoned me because he is no longer able to feed me. He is sure that you, miss, with your good heart, would want to take care of me and cook me yummy, lovely oats soup. I’m very hardworking and affectionate, and as for TV, I’m absolutely crazy about cartoons. As I’ve mentioned many times before, one of the most impressive aspects of the Pushkin Children’s range is the focus on ensuring quality translations, and for An Elephantasy the publisher has opted for another high-profile writer. Daniel Hahn is an award-winning translator from several languages (you may remember that he was shortlisted for the Man Booker International Prize this year for his work on Angolan writer José Eduardo Agualusa’s A General Theory of Oblivion). In addition, he’s the author of The Oxford Companion to Children’s Literature, meaning he’s a man who knows what’s what when it comes to kids books. In fact, only a few days ago, I saw an article of his asking where the next crop of young literary heroes will come from (the answer, it seems, is from Pushkin and other brave presses…).